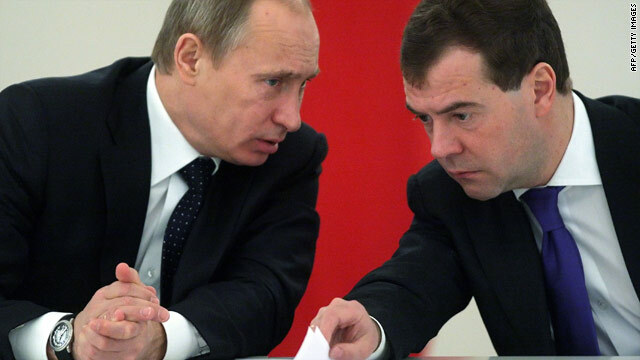 Russian Prime Minister Vladimir Putin and President Dmitry Medvedev during a State Council session on January 22, 2010. Washington (CNN) -- A new arms-control treaty between the United States and Russia is nearly complete, the White House said. Progress on a pact was detailed in a brief statement Wednesday. "President Obama spoke with President Medvedev of Russia to thank him for his hard work and leadership on the New START treaty negotiations, as the two sides have made steady progress in recent weeks," the White House said. "The presidents agreed that negotiations are nearly complete, and pledged to continue the constructive contacts that have advanced U.S.-Russian relations over the last year." Talks are expected to resume next week in Geneva, Switzerland. Obama hailed the developments during Wednesday's State of the Union address. "The United States and Russia are completing negotiations on the farthest-reaching arms-control treaty in nearly two decades," he said. The 1991 Strategic Arms Reduction Treaty, commonly known as START, expired on December 5, but the leaders agreed to honor its spirit until a new treaty could be negotiated to replace it. Obama and Medvedev, who met in mid-December in Copenhagen, Denmark, had hoped to sign an agreement by the end of 2009, but fell short of reaching a deal. At the time, U.S. Assistant Secretary of State P.J. Crowley cited a few hurdles to an agreement, including the complexity of the weapons systems, agreement on the numbers of warhead reductions, and verification, but held out hope for a deal in early 2010. "Clearly ... we have made dramatic progress," Crowley said. "There are still issues that we continue to work through, so there's still more work to be done. But I think we remain confident that, given good faith and the ongoing efforts of both sides, that this will get done." The Russian Foreign Ministry's Web site also expressed optimism. "Preparation of the new treaty is practically complete," but "a few problems have to be overcome in order to finalize the treaty and submit it to [the] presidents of Russia and the United States," it said in late December. "This will be done very soon." In July, the leaders signed a joint understanding committing the United States and Russia to reduce their strategic warheads to a range of 1,500 to 1,675, and strategic delivery vehicles to a range of 500 to 1,100. Under the old treaty, the maximum number of warheads was 2,200 and the maximum number of launch vehicles was 1,600.